The White Sox team included: Adrian Del Castillo, Humberto Torres, EJ Doskow, Adrian Figueroa, Michael Mas, Luis Tuero, Michael Montes, Edison Renteria, Lency Delgado, Henry Villar, Brian Socorro, Jordan Rollins, Zach Goberville, Kevin Barreneche, Max Romero, Michael Ramirez, Kevin Martin, Austin Pollack, Raul Ibanez Jr., Yordy Cabrera, Danny San Pedro, Chris Medero, Nick Garcia, Alex Dominguez, Roger Ceballo, Jorge Perez, Robert Pena and Alejandro Torres. Zach Young was not a household name among Major League scouts on Monday morning, but by day’s end the senior right-hander from Sebastian found himself on the radar of every MLB team. 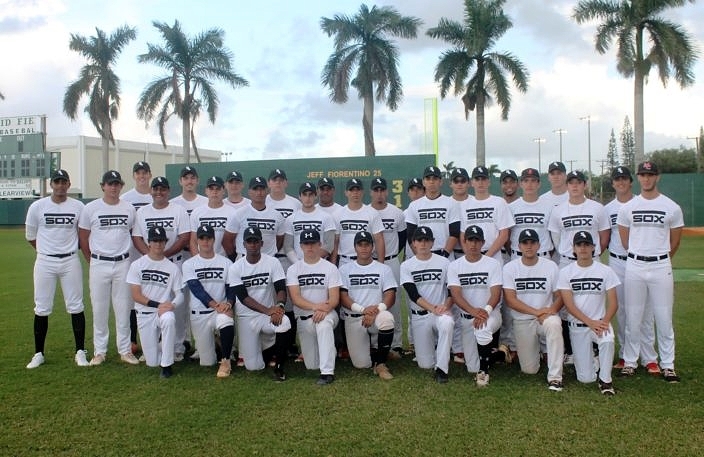 For over thirty years opportunities like that have been realized every fall thanks to the Dynasty Game, an all-star baseball showcase event produced by Chicago White Sox scout Pepe Ortega. 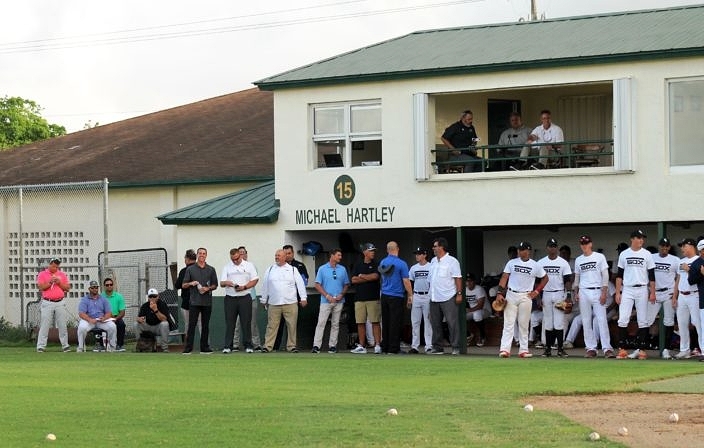 Held Monday night at Pat McQuaid Field at Doug Amos Stadium at Nova High in Davie, the event featured the top standouts from across South Florida competing in front of pro scouts from all 32 MLB organizations. Since 1983, the motivation in putting this event together has been in helping these players prove their way onto scout’s wish lists. Proven MLB stars like Lenny Harris, Alex Rodriguez, Eric Hosmer, Manny Machado, Alex Fernandez and Gio Gonzalez have all been in this all star game during their rise into stardom. It is an opportunity that players relish to be a part of, as best exhibited by Zach Young driving all the way down from Sebastian just to participate. Participants are selected by MLB scouts and divided into two teams. They are provided brand new uniforms for the game, with the hats coming from the Chicago White Sox and Dynasty providing two game shirts for each player. 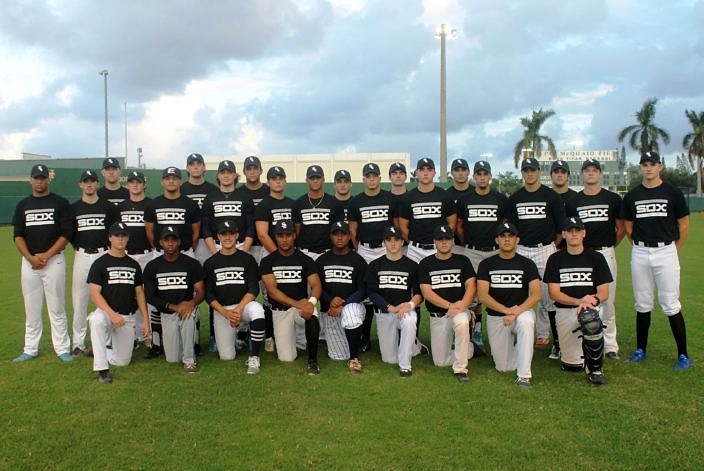 The coaching staff from St. Thomas Aquinas High managed the Black Sox team while the coaching staff from Hialeah High managed the White Sox club, and Ortega has kept the event self-sufficient all along so that players do not have to pay in order to be in the game. For the players, the largest challenge comes simply in the need to perform well against the most capable of their fellow peers. The best pitchers are facing the best hitters, with strength against strength. Participants are under the spotlight in front of a group that can greatly help their chances of realizing their MLB aspirations. The Black Sox included: Caleb Roberts, Nate Hansing, Triston Casas, Kenny Gonzalez, Alfie Soto, Nick Presto, Cory Acton, Jon Rodriguez, Andre Antonini, Raynel Delgado, Andrew Lee, Jered Campbell, Rick Shimko, Miguel Lavin, Drew Kendall, Christian Caro, Matthew Archer, Noah Izquierdo, Trace Moore, Bailey Montilla, Ryan Cabaracas, Chase Costello, Angel Tiburcio, Trevor Kniskern, Brenden Bell, Chris Seymour and Zach Young. Garcia came over from Mater Lakes Academy this year and is another player that helped put himself on the scout’s radar with his performance, which he admitted was even better than he had hoped for. Facing a tough bevy of dangerous hitters that the pitchers are not familiar with, the margin of error is very narrow. Events such as these can tend to favor the pitchers, as the hitters are not familiar with the arms they face and have to learn and adjust quickly to the pitchers. Yet the common denominator that makes it an equal challenge is the audience, as the venue is full of college and professional scouts in attendance that generate equal pressure for every participant. Long before showcase events had become the norm, this annual game has served as the spotlight for all of South Florida’s top talent. The event used to be held twice a year, with another in May, before the spring event was ended due to all the similar showcases that now happen at that time of year. It has become the norm for top players to shuttle all over the state from Fort Myers to Jupiter to Lakeland for other showcases throughout the year, but Monday’s Dynasty Game continues to serve as a rare and special opportunity for these players to stay close to home and have all the pro scouts come to them. Four scouts from every Major League organization were in attendance.